October 9, 2013 Washington Hebrew Congregation Washington, D.C.
May 4, 2008 American Psychiatric Association Washington, D.C.
September 19, 2004 SPAN USA Lincoln Memorial, Washington, D.C. Suicide would appear to be the last taboo. The suicide of a loved one is still an act most people are unable to talk about--or even admit to their closest family or friends. This is just one of the many painful and paralyzing truths author Carla Fine discovered when her husband, a successful young physician, took his own life in December 1989. And being unable to speak openly and honestly about the cause of her pain made it all the more difficult for her to survive. With No Time to Say Goodbye, Carla brings suicide survival from the darkness into light, speaking frankly about the overwhelming feelings of confusion, guilt, shame, sadness, anger, and loneliness that are shared by all survivors. Carla draws on her own experience and on conversations with many other survivors--as well as on the knowledge of counselors and mental health professionals. She offers a strong helping hand and invaluable guidance to the vast numbers of family and friends who are left behind by the more than 30,000 people who commit suicide each year, struggling to make sense of an act that seems to them senseless, and to pick up the pieces of their own shattered lives. And, perhaps most important, for the first time in any book, Carla allows survivors to see that they are not alone in their feelings of grief and despair. The book, now in its 23rd printing, is also available on EBooks and has been translated into Japanese, Korean, and Portuguese. NO TIME TO SAY GOODBYE IS NOW AVAILABLE IN AUDIOBOOKS NARRATED BY CARLA FINE. Buy from Amazon, Barnes & Noble and Broadway Books Also available in Japanese; Korean from Kungree Publishers; and Portuguese from Martins Fontes Publishers. Suicide touches people's lives across generations, creating an unparalled legacy of pain, mystery, and loss. 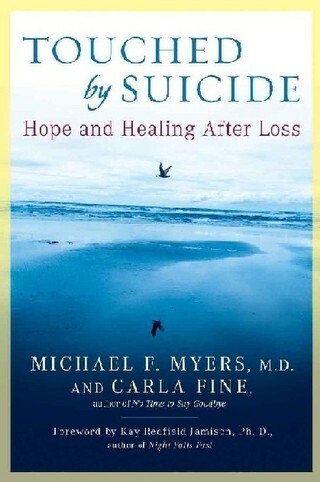 This book, written with Dr. Michael Myers, one of the leading clinicians in the field of suicide and professor of psychiatry at the University of British Columbia in Vancouver, offers detailed steps, practical suggestions, and compassionate advice for how to cope after suicide. The first-hand stories and original research in Touched by Suicide will help you and your family begin to make sense of suicide and know what to do when suicide affects your life. Strong, Smart, and Bold shows parents and caregivers how to raise a confident, courageous, and self-sufficient girl. Based on the successful approach of Girls Inc., the nation's leading empowerment organization for girls -- which improves the lives of girls through its programs, research, and advocacy -- the book offers proven techniques and compelling success stories to bring out a girl's spirit as early as possible and to give her the self-assurance she needs to thrive in an increasingly complex and pressured world. Strong, Smart, and Bold presents interactive activities that will help equip a girl with the important knowledge, key life skills, and confidence to accomplish her goals.